Originally developed in 2009 (Hoshino & Fujii), the locus-specific ChIP technologies enable us to purify specific genomic regions retaining molecular interactions and identify molecules interacting with those regions. Locus-specific ChIP technologies consist of insertional chromatin immunoprecipitation (iChIP) and engineered DNA-binding molecule-mediated chromatin immunoprecipitation (enChIP; Fujita & Fujii, 2013). In iChIP, specific genomic regions tagged with the recognition sequences of an exogenous DNA-binding protein such as LexA are subjected to affinity purification (Fig. 1). In enChIP, specific genomic regions are tagged with engineered DNA-binding molecules such as TAL proteins and the CRISPR system consisting of a catalytically inactive form of Cas9 (dCas9) plus guide RNA (gRNA) for biochemical purification (Fig. 2). For additional information and protocols, check our references for the plasmids or browse the Fujii Lab web page. 85586 gRNA Cloning Vector Bbs I ver. 2 An empty sgRNA expression vector. sgRNA sequence can be cloned into BbsI site. gRNA scaffold has efficient ver. 2 structure. 92220 pLenti_dCas9-2xAM Lentiviral plasmid expressing dCas9-2xAM and gRNA cloned in Bbs I sites. 92221 pLenti_dCas9-2xAM_hIRF-1 Lentiviral plasmid expressing dCas9-2xAM and gRNA for human IRF-1 promoter. 98041 Sa-dCas9-NLS-3xFLAG/pcDNA3.1 Expresses Sa-dCas9-NLS-3xFLAG in mammalian cells for enChIP analysis to purify specific genomic regions of interest. 98134 hIRF-1 gRNA #409 (Sa) Expresses a guide RNA (gRNA) to target human IRF-1 promoter for the Sa-Cas9 system. 105283 hIRF-1 gRNA #351 (Sa) Expresses a guide RNA (gRNA) to target human IRF-1 promoter for the Sa-Cas9 system. An enChIP system for the analysis of bacterial genome functions.Fujita T, Yuno M, Fujii H. BMC Res Notes. 2018 Jun 14;11(1):387. doi: 10.1186/s13104-018-3486-3.PubMed. Promoter-associated proteins of EPAS1 identified by enChIP-MS - A putative role of HDX as a negative regulator. Hamidian A, Vaapil M, von Stedingk K, Fujita T, Persson CU, Eriksson P, Veerla S, De Preter K, Speleman F, Fujii H, Påhlman S, Mohlin S.Biochem Biophys Res Commun. 2018 May 5;499(2):291-298. doi: 10.1016/j.bbrc.2018.03.150.PubMed. enChIP systems using different CRISPR orthologues and epitope tags. Fujita T, Yuno M, Fujii H. BMC Res Notes. 2018 Feb 27;11(1):154. doi: 10.1186/s13104-018-3262-4.PubMed. Transgenic mouse lines expressing the 3xFLAG-dCas9 protein for enChIP analysis. Fujita T, Kitaura F, Oji A, Tanigawa N, Yuno M, Ikawa M, Taniuchi I, Fujii H.Genes Cells. 2018 Apr;23(4):318-325. doi: 10.1111/gtc.12573. Epub 2018 Feb 26.PubMed. Locus-specific ChIP combined with NGS analysis reveals genomic regulatory regions that physically interact with the Pax5 promoter in a chicken B cell line. Fujita T, Kitaura F, Yuno M, Suzuki Y, Sugano S, Fujii H. DNA Res. 2017 Oct 1;24(5):537-548. doi: 10.1093/dnares/dsx023. PubMed. Identification of physical interactions between genomic regions by enChIP-Seq. Fujita T, Yuno M, Suzuki Y, Sugano S, Fujii H.Genes Cells. 2017 Jun;22(6):506-520. doi: 10.1111/gtc.12492. Epub 2017 May 5.PubMed. 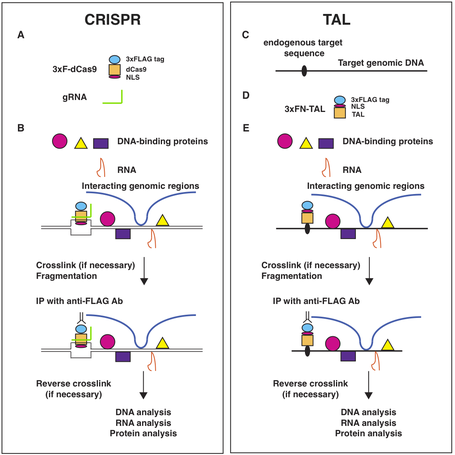 Allele-specific locus binding and genome editing by CRISPR at the p16INK4a locus. Fujita T, Yuno M, Fujii H. Sci Rep. 2016 Jul 28;6:30485. doi: 10.1038/srep30485.PubMed. Efficient sequence-specific isolation of DNA fragments and chromatin by in vitro enChIP technology using recombinant CRISPR ribonucleoproteins. Fujita T, Yuno M, Fujii H. Genes Cells. 2016 Apr;21(4):370-7. doi: 10.1111/gtc.12341. Epub 2016 Feb 5.PubMed. Identification of non-coding RNAs associated with telomeres using a combination of enChIP and RNA sequencing. Fujita T, Yuno M, Okuzaki D, Ohki R, Fujii H. PLoS One. 2015 Apr 13;10(4):e0123387. doi: 10.1371/journal.pone.0123387. eCollection 2015.PubMed. A critical role of the Thy28-MYH9 axis in B cell-specific expression of the Pax5 gene in chicken B cells. Fujita T, Kitaura F, Fujii H. PLoS One. 2015 Jan 21;10(1):e0116579. doi: 10.1371/journal.pone.0116579. eCollection 2015.PubMed. Efficient isolation of specific genomic regions retaining molecular interactions by the iChIP system using recombinant exogenous DNA-binding proteins.Fujita T, Fujii H. BMC Mol Biol. 2014 Nov 27;15:26. doi: 10.1186/s12867-014-0026-0.PubMed. Identification of proteins associated with an IFNgamma-responsive promoter by a retroviral expression system for enChIP using CRISPR. Fujita T, Fujii H. PLoS One. 2014 Jul 22;9(7):e103084. doi: 10.1371/journal.pone.0103084.PubMed. Efficient isolation of specific genomic regions and identification of associated proteins by engineered DNA-binding molecule-mediated chromatin immunoprecipitation (enChIP) using CRISPR. Fujita T, Fujii H. Biochem. Biophys. Res. Commun. 2013 Sep 13;439(1):132-6. doi: 10.1016/j.bbrc.2013.08.013.PubMed. Identification of telomere-associated molecules by engineered DNA-binding molecule-mediated chromatin immunoprecipitation (enChIP). Fujita T, Asano Y, Ohtsuka J, Takada Y, Saito K, Ohki R, Fujii H. Sci Rep. 2013 Nov 8;3:3171. doi: 10.1038/srep03171.PubMed. Direct identification of insulator components by insertional chromatin immunoprecipitation. Fujita T, Fujii H. PLoS One. 2011;6(10):e26109. doi: 10.1371/journal.pone.0026109.PubMed. 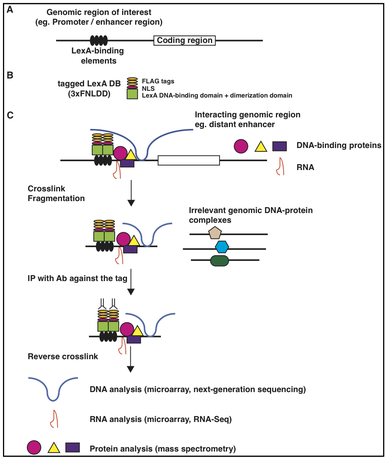 Insertional chromatin immunoprecipitation: a method for isolating specific genomic regions. Hoshino A, Fujii H. J. Biosci. Bioeng. 2009 Nov;108(5):446-9. doi: 10.1016/j.jbiosc.2009.05.005.PubMed.